June 2007: Up in the U.P. Going into the weekend of June 22-24, 2007, I anticipated nothing more than a 4 hour drive over to Illinois to enter our ’65 Corvair in the 4th Cruisin’ Route 66 to Litchfield on Car Festival, as we’ve done since 2004. Thanks to Mother Nature, that all changed. We awoke Friday morning to rain. The forecast for Litchfield was for up to 3 inches of rain throughout the entire weekend. We then decided spending two days in an $80 motel room in Litchfield, IL wasn’t sounding too appealing, so we canceled our reservation. We still wanted to make a 3-day weekend out of it, so we finally decided we’d take a trip up to our favorite region in the Midwest: The Upper Peninsula of Michigan. Leaving Speedway at 10:15 am….not in the Corvair….we jumped on the “evil I” Interstate 65 north and headed for Chicago. After encountering the typical Chicago traffic, we made a quick lunch stop at the newly remodeled O’Hare Oasis, which Pat used to stop at during those family vacations on the way to Minnesota in the 1970’s. North of Milwaukee, we joined I-43 north and headed towards Green Bay, where we finally got off the interstate and onto US 141. 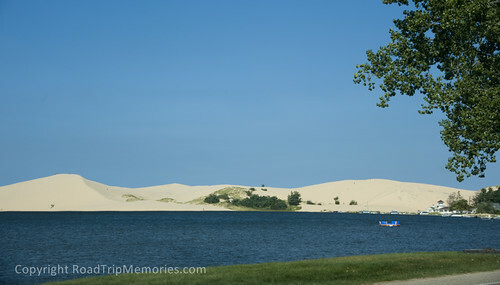 Our destination for the night was Iron Mountain, MI, just across the Wisconsin/Michigan border. 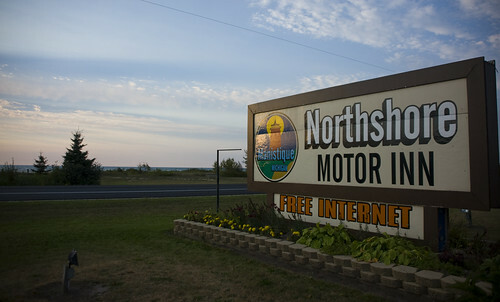 We stayed here two years ago on our Lake Michigan Loop Trip at an America’s Best Inn motel along US 2/141. This was a motel Pat and his parents stayed at in 1985 on a trip they took through Michigan’s UP and into Minnesota. Thanks to some photos Pat took from that trip, we found the room they stayed in, but, as was the case in 2005, the room was in a wing of the motel that wasn’t being used and was in sad shape, as we peered through the windows. This time, we stayed at The Timbers Motor Lodge, a couple miles down the road. After dinner at a local pizza/ice cream shop, we called it a night after cruising around to see what Iron Mountain had to offer before calling it a night. Saturday morning we went north for our next destination: Copper Harbor, MI. This was also part of the trip Pat took in 1985. He really wanted to see how much of the things he saw on that trip were still there, such as places where they stayed and restaurants where they ate. Pat says it was this trip, some 22 years ago as a 17 year old, that gave him the love of the “Traveling Vacation,” where the vacation consists of traveling from place to place to place. After hooking up with US 41, we made our way through Houghton and crossed into the Keweenaw Peninsula in Hancock. From there, we hit M-26 through Eagle Harbor where Pat saw the Shoreline Motel, which was a stop during his ’85 trip. It was still there as he remembered it. We then drove up the fabulous Brockway Mountain Drive, which towers HIGH above the tops of the pines and silver birches below, and gives incredible views of Copper Harbor and Lake Superior. Driving down the drive and into Copper Harbor brought back many memories for Pat. We passed the Harbor Haus Restaurant, a dinner stop in ’85, on the banks of the harbor and saw many small, well kept motels. East of town near Fort Wilkins State Park, Pat saw the now closed Norland Motel, where they spent their night in ’85. A mile east, we encountered the end, or beginning, of US 41, some 1990 miles north of Miami, FL. We ended our visit to Copper Harbor and turned around and headed south on US 41 back towards Iron Mountain, where I had to visit an Italian market we had seen the night before. The whole time we were in bear country, I had yet to see a bear. I had all but given up when a few miles before we arrived in Iron Mountain, I took a short nap. I nearly had a heart attack when Pat awoke me yelling “Bear, Bear!” In my grogginess from my nap, I didn’t see it as Pat was trying to guide my eyes to it with his index finger as it galloped across US 141. Pat turned the car around and we went back to the area where it had crossed. We drove down a snowmobile path, which isn’t hard to do in a Honda Civic, and saw the little black bear rustling through some foliage. He heard the car and looked directly at us from about 20 yards away. He decided he didn’t want any part of us, so he meandered back into the woods. So the animal part of our trip was complete: We saw plenty of deer, a bald eagle, and now the long, sought after black bear. 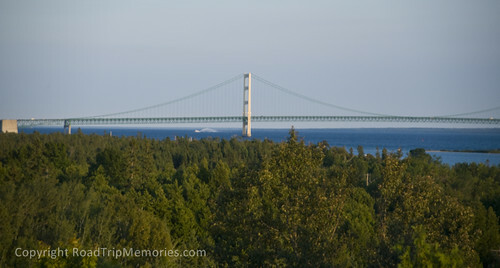 We arrived back in Iron Mountain, visited the Italian market, had an early dinner/late lunch at a place that sells pasties, then hit the road for Mackinaw City. We stopped at another pasty place for some ice cream, and jumped on US 2 for the four hour trip to Mackinaw City. This was our first time crossing the Mackinaw Bridge at dusk and the scene with the bridge lit up was incredible.. Pat’s still a chicken crossing it, just like he was the first time he did when he was 5! 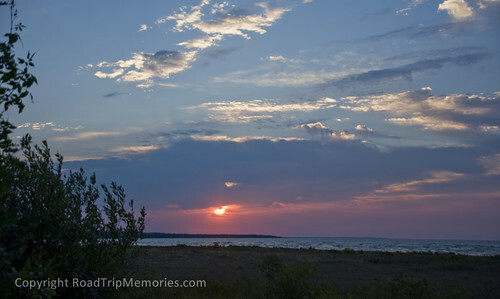 We found a GREAT motel almost next to the bridge and right on the shore of Lake Huron called the Riviera Motel. We got the last room with a lakeside view and it was one of the cleanest independent motels you’ll find ANYWHERE in the U.S. We went to downtown Mackinaw City and visited what shops were left open at 10 pm. Sunday morning I got up at 5 am to catch the sunrise over Mackinac Island and Lake Huron. Take a look at the pictures to see how incredible it is to watch. Pat, meanwhile, continued to snooze until I got back to the room at 6:30. We had breakfast at a local restaurant and then went back into town to shop. We came across a kite shop and bought ourselves a couple of kites and headed back to the shore next to the bridge, as it was a perfect day to fly a kite. Being the cheap German he is, Pat bought a kite that was $10 cheaper than mine. Well, his never saw the sky, so we made a trip back to the kite shop where he upgraded. It’s not been test flown yet, so the jury’s still out on that one. It was now nearly 1 pm and we knew we had to make the 8 hour trip back home. So, back on the ”evil-I”; it was….this time I-75. After a McLunch to complete the generic journey on the interstate home, we arrived back in Speedway at 9 pm…..some 1500 miles later!